Sounding factory fresh with only a few small marks left on the cabinets, they are ready to be enjoyed again for the next 40 years. "High quality loudspeakers have been an obsession of mine since a very early age. HIGH-END SMALL MONITOR LUTE-SHAPED LOUDSPEAKERS FROM PROFESSIONAL LOUDSPEAKER MANUFACTURER. 28X20X26 CMS. Removed from a pair of JR149. To celebrate the 80th Anniversary of Wharfedale, this special edition Denton is a traditional two-way bookshelf speaker constructed with a Tungsten cloth grille, hand veneered. 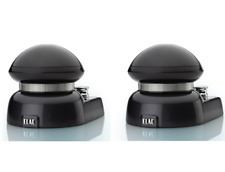 Elac 4Pi Plus.2 omnidirectional ribbon super-tweeter can be placed on top of your main, direct-radiating loudspeakers for perfect spaciousness not found with any conventional loudspeaker. The 360-degree omnidirectional ribbon tweeter yields a resonance-free upper cut-off frequency of 53 kHz and makes this tweeter an ideal component for the reproduction of SACD and DVD-A source material. 2 x 3020 Bookshelf Speakers. What more could you want from a pair of bookshelf speakers?. Enclosure type: 2-way reflex. 1 x User Manual. Frequency Response: 64Hz - 22kHz. 1 x White Cotton Speaker Handling Gloves. Monitor Audio Bronze BX Centre Speaker in Walnut. Condition is excellent. Boxed. This pair is missing the bi-wire plates and no spikes. Magnetic shield. Enclosure: Bass Reflex. Max music power: 90 Watts. For sale I have a pair of Fisher STE-M47 speakers in used but good condition. Tested and fully working! Small hole in one of the speaker grills as pictured otherwise in good condition. For sale quality Acoustic Solutions Instate 90 MK II Speakers in excellent and clean condition and in full working order. Superb performance with clear, dynamic sound and Bass reflex system. Both woofers and tweeters are original and in excellent condition. Full Working Order.No Front Covers. Tannoy Dual concentrics drivers de x2. X2 Tannoy Dual Concentrics. Australia £95. China, Hong Kong, Singapore, Thiland £85. Canada & USA £60. "High quality loudspeakers have been an obsession of mine since a very early age. I built my first speaker at the age of 10 and it signified the start of a lifelong pursuit. Musically they are stunning with a full, rich 70's sound that is an absolute pleasure to listen to. Pair of ex-display Russel K in walnut with black baffle. Fabulous speakers. Monoimpulso Modelo Ss standmount altavoces-ex Dem. Cranberry cloth finish. Have to be heard to be be believed. The QX series was designed to marry Mission’s advanced engineering with a highly stylish and attractive aesthetics allowing the speakers to fit perfectly with any system and blend into virtually every type of décor. WE ARE AN AUTHORISED AVI DEALER. PRE OWNED/USED. OVERALL CONDITION IS GOOD, ONLY MINOR SIGNS OF WEAR. FULLY TESTED & IN GOOD WORKING ORDER. Highlands and islands will be more expensive. Wharfedale Laser 80 HiFi Bookshelf Speakers (Pair) inc Warranty. Mission 700 speakers - very good condition, sought after amongst audiophiles due to their excellent dynamic performance. The speakers did have wall brackets attached at one point so just to make you aware there are some small screw holes on the back casing (see photos). These will not affect operation but felt needed to highlight so that any potential buyer is aware from a cosmetic perspective before they purchase. Speakers will be sent well packaged using 1 day shuttle service. China - £109.95. Russia - £99.95. Cyprus, Malta - £69.95. New Zealand - £119.95. Australia, Hong Kong, Macau, Japan, Malaysia, Singapore, S. Korea, Thailand, Taiwan, Vietnam, Philippines, South Africa - £109.95. 4TH GENERATION. The sculpted low-diffraction cabinet of the Gold 50 houses a single 5.5"RST bass driver andC-CAM ribbon. 55 Hz — 60 kHz. 50 — 100 W. 300 x 170 x 263 mm (11. 7.5 kg (16 lb 8 oz). 300 x 170 x 290 mm (11. ). Krescendo HiFi is a specialist in Linn and Naim HiFi. Here is a great opportunity to buy a stunning a pair of Q Acoustics Conept 20 speakers gloss white. The speakers havebeen used by us in our own second system. Luxurious Italian hand made speakers. The lower, ported, section of the Xplorer houses not one, but two of Neat’s P1-R2 bass drive units. These are similar to the R3 unit, but specially tailored for extended low-frequency response. Generally in Good Condition.Full Working Order. Get Free Quotes. Fairly good condition on the front, one tiny hole in fabric. They are in full working order throughout. Used but fully working great speakers. Edifier R2730DB Bluetooth Active Bookshelf Speakers Black (Pair). - Active bookshelf speaker with Bluetooth pairing capability for music playback. - Passive Speaker: 218mm x 393mm x 294mm (W x H x D). They are in Full Working Order throughout, they sound Very Good Indeed. This item is in stock ready for immediate dispatch with full VAT receipt and manufacturer warranty. Due to our links with many top manufacturers we are able to offer you this bundled kit, which comprises of a 15W per channel Bluetooth 4.0 amplifier and a pair of 5″ round waterproof ceiling speakers with moisture resistant polypropylene cone, which makes them perfect for most domestic and commercial applications including kitchens, bathrooms, swimming pools etc. The low impedance cones offer clean and accurate sound response and are easy to install using the included speaker cable. Heco Interior Altavoces Estéreo HiFi Plus 303 Alemán Audiophile calidad. Good working condition. You take what you see in the pictures only. Stirling BBC LS3/5a V2 has been specifically designed by Stirling Broadcast for the exact requirements of the BBC. Mordaunt-Short MS5.20 Speakers-Made in Great Britain-SUPERB SOUND Hifi packaging. Condition is Used.Dimensions H 37cm W 21cm D 23cm. Dispatched with eBay delivery – Shutl 1 day. DALI ZENSOR 5. WE ARE AN AUTHORISED DALI DEALER. Highlands and islands will be more expensive. Superb performance and quality as we can expect from NAIM. The NAC A4 cable will be perfect to improve the sound performance in your Audio System. Linn Nac A4 is a high quality, low-loss loudspeaker cable designed for use in single-wire applications. 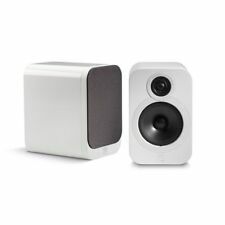 New Edifier R1800BT Wireless Bluetooth Active Bookshelf Speakers (Pair). This smart angle creates a clear sound reference while reducing distortion. With a total output at 70 watts through 4 speaker drivers this 2.0 studio bookshelf speaker makes good on big sound. The finishes available are Xpresso, Walnut and Mahogany. Totem Mite Micro-Monitor Loudspeaker. Who is Totem?. Woofer 5.5" / 140 mm granulated. 102 dB before dynamic compression. Sensitivity 87 dB/W/m. Superb Bowers & Wilkins CM6 S2 Speakers & Stands - Piano Black. The most precise and powerful small speaker in the CM Series - the CM6 S2 standmount speaker is the only CM standmount to feature Tweeter On Top technology. Product Series IKON MK1. Frequency Range ( /-3 dB) [Hz] 43 - 30,000. Speaker Type Front. ability to make itself virtually disappear – leaving just you and the music. or wall (brackets included) without muffling bass output.